Teaching tip: Hit “CC” for closed captions or follow along using the transcript. Directions: Read the summary below first, and then watch the video. The 2018 midterm elections will be held on Tuesday, Nov. 6th. Historically, midterm elections act as a referendum on the president. How popular he is often determines how much of a drag or a boost he’s going to mean for his party. Amy Walter of the Cook Political Report and Susan Page of USA Today discuss the potential political fallout for Republicans in the midterm elections and whether or not the Democrats have a chance of taking the House or the Senate. NOTE: Start video at 2m:44s and play until end. Answer the discussion questions as a class, in your journal or with a partner. 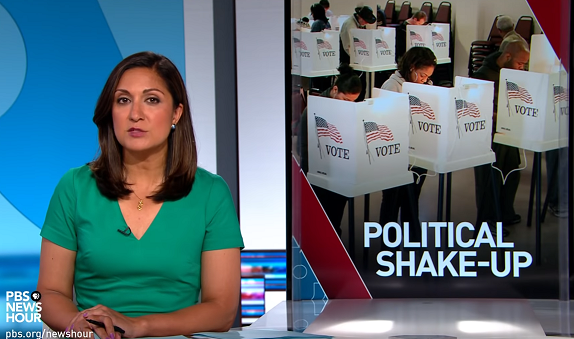 Essential question: What role do midterm elections play in the U.S. political system? Why are the 2018 midterm elections attracting so much attention? Is this a departure from the past or normally the case? How could you find out? What issues will inspire voters to turn out to vote in November? Media literacy question: What do you know about the Cook Political Report and USA Today, the two news outlets for which journalists Amy Walter and Susan Page work, respectively? Civic Engagement Part 3: Participation in civic life. In this 60 Second Civics podcast we discuss the benefits of participating in civic life. This episode originally aired in October 2011.